Bogdan fly fishing reels are a real treasure for any fisherman, especially during a stay at the Rifflin'Hitch Lodge when fly fishing the rivers in Southern Labrador in Newfoundland Labrador, Canada. Fly fishing in the area around the Rifflin'Hitch Lodge in Southern Labrador, Canada is very popular and having the right equipment and gear, including reels, makes fly fishing more enjoyable. 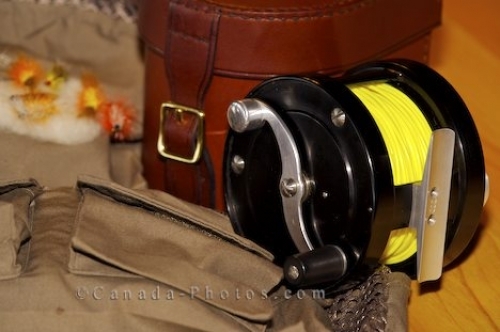 This Bogdan fly fishing reel sits along side its case, a fishing vest and some lures in preparation for a fly fishing adventure. Bogdan fly fishing reel and case, Rifflin'Hitch Lodge, Eagle River, Southern Labrador, Labrador, Newfoundland Labrador, Canada. Picture of a Bogdan fly fishing reels and case, a fishing vest and lures at the Rifflin'Hitch Lodge in Southern Labrador.